HYDERABAD: Bathukamma festival, which is fondly celebrated by women in Telangana during Dasara entered the Guinness World Records on Saturday. As many as 9,292 women from various parts of the State took part in Bathukamma celebrations held at LB Stadium with a special focus on creating a world record, while Telangana brand ambassador Sania Mirza and Olympian P V Sindhu added glamour to the event. Taking a cue from Kerala women’s Guinness record accomplishment where 5,015 women celebrated Onam in 2015, Telangana women succeeded in ensuring Bathukamma festival create similar world record. In its bid to popularise Bathukamma festival across the globe, the State government held Bathukamma celebrations with 9,292 women at LB stadium here. The womenfolk played Bathukamma by revolving around the Bathukammas (beautiful flower stack arranged with different unique seasonal flowers) by singing folk songs with synchronising steps and claps. “They performed this dance for 12 minutes at a stretch, making it get into the Guinness World Records like Kerala’s Onam celebrations. The programme recognised by the Guinness World Records committee as world record. Soon, a certificate in this regard will be issued by it,” said GHMC Commissioner Bonthu Rammohan. Earlier, as women started coming to LB Stadium from morning itself, the surroundings wore a festive look making the environs colourful. ‘Bathukamma Bathukamma Uyyalo.. Bangaru Bathukamma Uyyalo’ songs reverberated and filled the air with festivity. Women formed circles around the 20ft tall Bathukamma set up in the middle of the stadium and started performing Bathukamma dance. Though more than 10,000 women belonging to all age groups enthusiastically participated in Bathukamma celebrations, thanks to the elaborate arrangements made by officials, there was no untoward incident or congestion. Even sudden rain during the celebrations was unable to dampen the spirits of the women. Women from foreign nations also participated in the celebrations. “We have been celebrating Bathukamma festival since childhood. We wait for Dasara festival holidays especially to celebrate Bathukamma. No other celebration is as beautiful and joyful as Bathukamma. Our joy only got doubled to be part of world record,” said Divya Sapandana a young woman from Attapur. Telangana government is officially celebrating Bathukamma celebrations and to ensure that the world record accomplishment goes smoothly, officials belonging to GHMC, culture, tourism departments and police made elaborate arrangements. “We have been planning and working for the past one week to smoothly conduct Bathukamma celebrations. 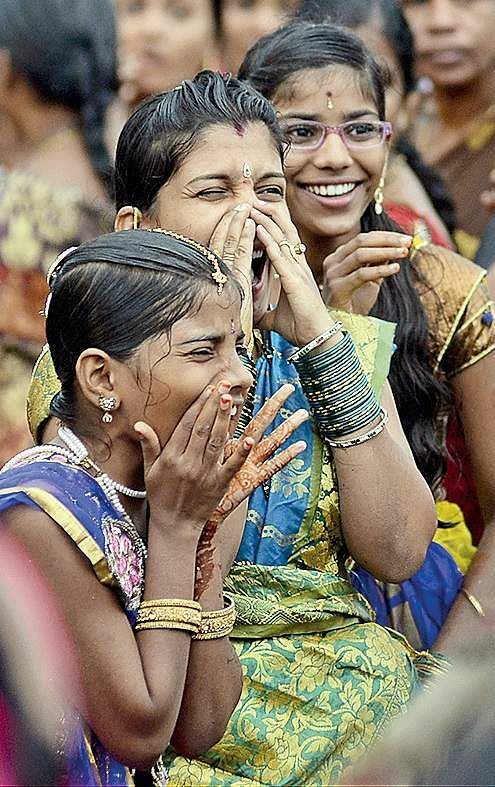 The number of women participated in the celebrations have exceeded our expectations but we are able to successfully conduct the world record winning celebrations,” said GHMC Commissioner Bonthu Rammohan. Many eminent people participated in the festivities along with their family members.